For Father’s Day I took my Dad to the Cholmondeley Pageant of Power in Cheshire which is a similar event to the Festival of Speed, albeit on a slightly smaller scale. In amongst the modern supercars and aero engined racecars from the 1930s (42 litre V24 engines!!!) 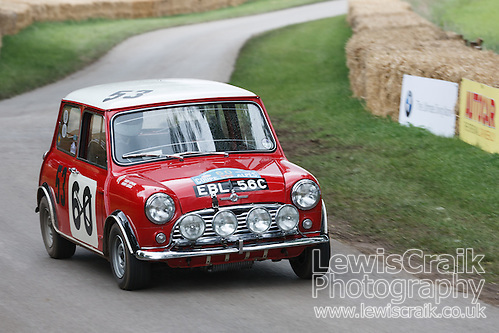 my favourite car of the event was this little Mini Cooper which was driven by Paddy Hopkirk in the mid 1960s. Unlike a lot of the other historic vehicles there which looked like they had come straight out of a museum, with spotless engine bays, this Mini looked like it had been driven hard, the engine bay was suitable oily and the block painted in the original British Leyland green. Other highlights were Bentley demonstrating the smoothness of their engine, by balancing coins on the rocker cover and the drive there and back with my Dad, we were in his Porsche Boxster with the roof down, managed to avoid motorways for both journeys and stopped for an Olympic Breakfast at the Little Chef on the way there, all ingredients for a good road trip!